Bau Trang (Bàu Trắng) or Bau Sen (Bàu Sen), Bach Ho (Bạch Hồ), Bau Cat (Bàu Cát) is located about 60km from Phan Thiet city, Binh Thuan (Bình Thuận) province, Vietnam. This place is considered the most beautiful lakeside road in Vietnam. Upon visiting Bau Trang, you can see lots of lotus flowers in the middle of large lakes. 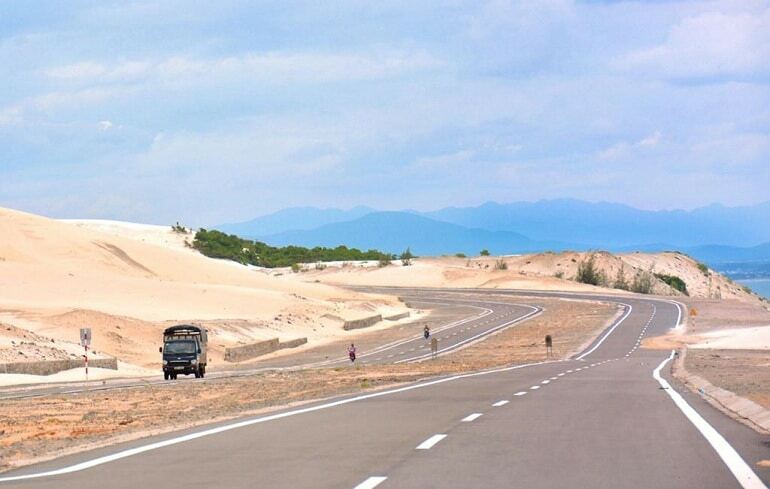 The road around the lake is extremely romantic and long and surrounded by the wide-stretch sand dunes. What Is The Best Time To Visit Bau Trang? You should visit Bau Trang in summer months (from July to August) to enjoy the best trip. 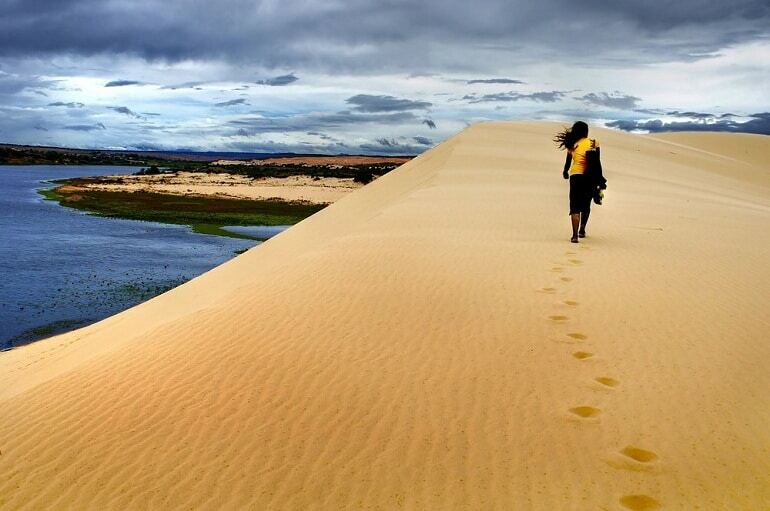 As the terrain here is mainly desert and sand dunes, you should visit Bau Trang in dry season. By such, you are likely to experience the rain because the rainy season is not over. During this time, you will find the desert having a lot of green grass growing up. This is also the season that lotus blooms all over the lake. The best time to visit Bau Trang in the day is from early morning and late afternoon like 5AM to 9AM, 4PM to 6PM. How To Get To Bau Trang? Bau Trang is located in Hong Lam Hamlet (thôn Hồng Lan), Hoa Thang Commune (xã Hòa Thắng), Bac Binh District (Huyện Bắc Bình), Binh Thuan Province, about 65 km northeast of Phan Thiet City. Therefore, you can go to Phan Thiet or Mui Ne and transfer to Bau Trang. To get Bau Trang, you can choose to arrive by motorbike or by car, coach, train or bus. Option 1: If you depart from Hon Rom (Hòn Rơm), you can drive along the road to Mui Ne, go through Mui Ne market, Doi Hong (Đồi Hồng) then continue going along the beach for about 12km to get to Bau Trang. Alternatively, you can move by Jeep vehicle from Hon Rom to get to Bau Trang. The expense for hiring a jeep is about 500.000 VND for 3-4 people. 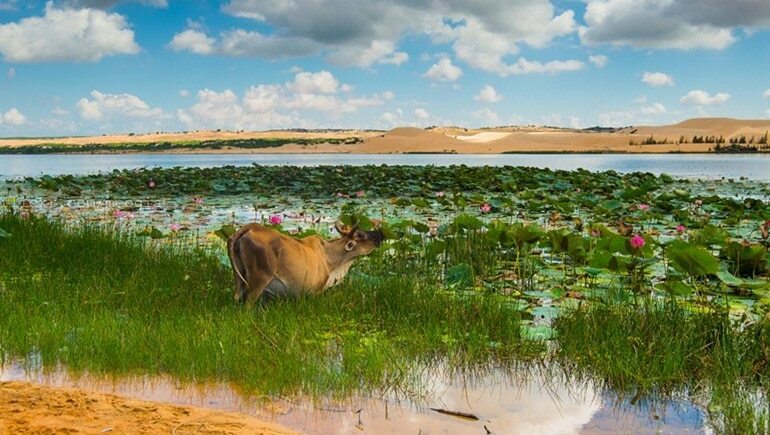 Option 2: If you depart from Phan Thiet City, you should follow the National Highway 1A to Luong Son town (Thị trấn Lương Sơn) and then turn right about 18km through the hills, scallops, and coconut forests to get to Bau Trang. The total distance is about 63km. However, the road is quite far so you should prepare your health well enough and drink adequate water. If you go from Ho Chi Minh City, you can take a coach to Phan Thiet City and then take a taxi to Bau Trang. Coach of Kumho Samco Express Freight Ltd.
You can take the train from Ho Chi Minh City to Phan Thiet for about 4 hours with the ticket price from 170.000 VND – 270.000 VND and then take a taxi to Bau Trang. To book train tickets, you can contact Saigon train station or book via internet. Where To Stay In Bau Trang? You can also prepare your camping gear to have a nice trip camping at Bau Trang. What Are Attractions In Bau Trang? Bau Trang has been existed for a long time. Used to be a huge lake in the past, Bau Trang was filled with sands by local people. As a result, a road appeared and crossed through the lake. This large lake has been divided into two parts from since that time, including a small lake and a large one. Because “Bau” in local language means “lake” so the locals call the small lake as “Bau Ong” (Bàu Ông) which means Mr. Lake and the larger lake is “Bau Ba” which means Mrs. Lake. Bau Ba has an area of 70ha with the widest area of 500m and the average depth of 5m. The deepest level of Bau Ba is 19m in the rainy season. As far as the shore, the water is gradually depleted. Today, this site is often referred to as Bau Sen, which means the Lake of Lotus. There are many lotus flowers planted in Bau Trang. The organisms in Bau Trang are diversifying with many types of freshwater fish, such as perch, catfish, catfish, grass carp, etc. The road between Bau Trang and Bau Ong has many ancient trees. This is one of the most beautiful ways in Vietnam that you should visit. You can explore sand dunes at Bau Trang by motorbike or terrain vehicle. Bau Trang has many shops for motorbike and terrain vehicle rental with different options. The average rental price of a small car and a big one is 300.000 – 400.000 VND / 20-minute trip and 800.000 VND – 1.000.000 VND / 30 minute trip respectively. You can also rent a small boat to go to the middle area of Bau Trang. 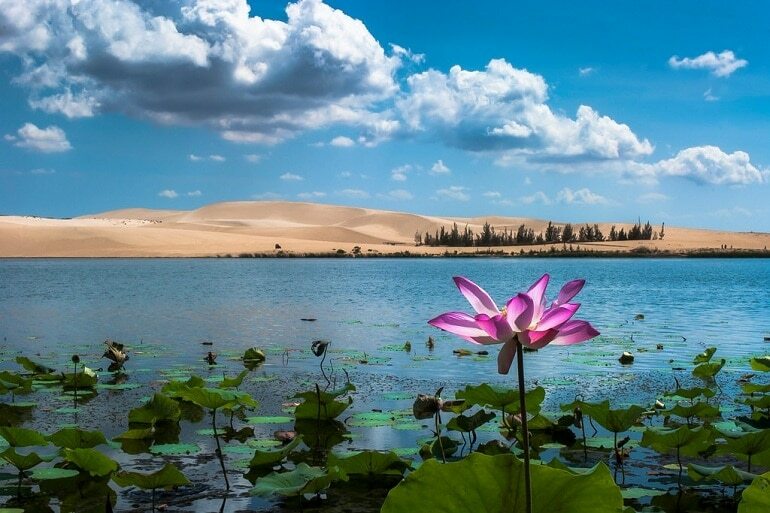 There are lots of lotuses and other flowers growing in this lake. While rowing out in the middle of the lake, you can pick some flowers or take beautiful pictures. What To Eat In Bau Trang? 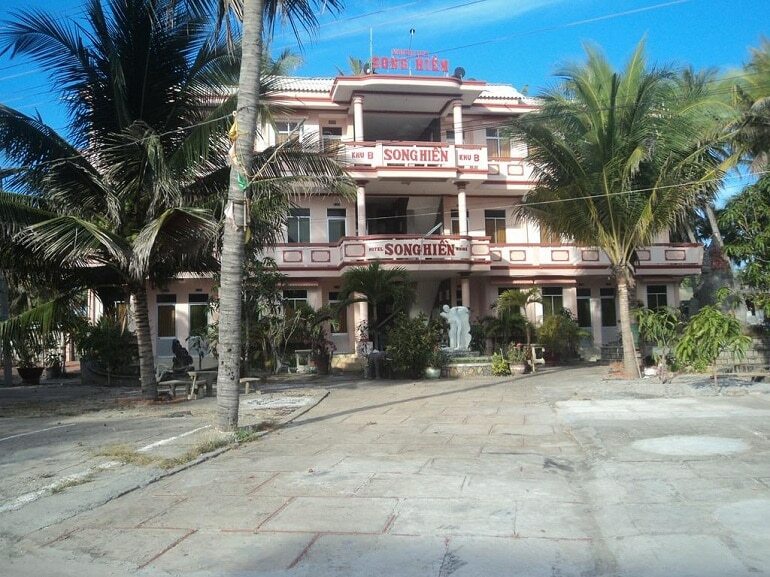 As Bau Trang is a very large sand dune with an unfavorable terrain, there are very few hotels or food outlets nearby. Therefore, you should prepare food by yourself or go back to Hon Rom to enjoy some dishes such as girdle cake, pan-cake with fish, etc. The above is the detailed information and tips on Bau Trang tourism that help you have the safest and most economical trip. Wish you have a fun trip! If you have any questions, please leave a comment, we will reply as soon as possible.